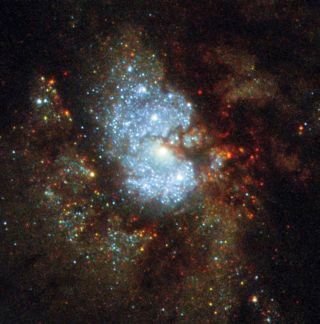 IC 342 is beautifully captured by the Hubble Space Telescope. The spiral galaxy is a mere 10 million light-years from Earth. The spiral galaxy IC 342 shines prominently in this image from the Hubble Space Telescope, but viewing it in the night sky from Earth is much more challenging. In fact, it's nicknamed the Hidden Galaxy. Although this spiral galaxy is relatively close to Earth, at just 10 million light-years away, it's difficult to see because it sits along the observable band of our own Milky Way galaxy. Indeed, it is "no easy feat" to view IC 342, European Space Agency officials said in a statement. To capture an image like this one, the Hubble Space Telescope has to peer through the space dust, the glow of cosmic gas and the brightly lit stars that sit inside the Milky Way and ultimately obstruct the view of IC 342. The image of the galaxy isn't just remarkable because of how rare it is but also because of what the picture shows us about star births. The glittering aquamarine sparkles in the middle of the velvet-red cloud formations are the core of IC 342. Here, ionized hydrogen marks where new stars are arising. This image was taken by the Hubble telescope in partnership with NASA and the European Space Agency.